Tried it tonight for the first time. Was good. However as mentioned above the potato was dry so next time I will scoop some potato out and mix with 2 tbsp fat free sour cream, restuff it and then put on the veggies and meat. I think that will help, be compatible in taste, and only add 1 point. Delicious! My Potato part was a tad dry (might have overlooked it) so I added just 1 T of cream cheese and mashed it in with the potato! Toppings were delicious! Would definitely make again! I made this tonight and it was amazing!! My husband does not like mushrooms so we skipped those but even without them it was DELICIOUS!! I did cook the veggies a little bit longer but that is just my preference. Thank you so much. This is a great recipe. This calculates to 10 SMART POINTS, not 9.. Just in case anyone does the calculations yourself to double check! Using reduced fat cheese makes it 9 🙂 Trying tonight, very excited! Are you getting this with Recipe Builder? I ask because the calculator will always be off. i used recipe builder and got 11 SP myself. I still think its a good meal as I wouldn’t have any sides with it, but not sure why the difference. Did it as 4 servings and 1 serving (dividing all ingredients by 4) and got same SP both ways. Yum! Does need a little extra flavor. 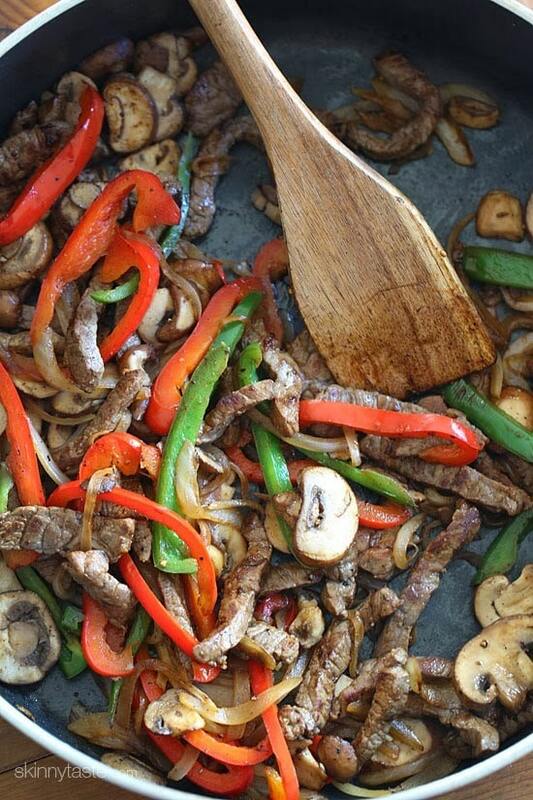 Steak sauce or balsamic vinegar is lovely as an addition. Gina, I asked two men in the meat department (of the Fresh Market, no less) for "beef round sandwich steaks" and they looked at me like I had two heads. Maybe it got lost in southern translation. I ended up with skirt steak, so hopefully this was an ok substitution? It was a great meal! We had this for dinner last night. I would make it again after modifying a little. As written, both my husband and I thought it was ok, but lacking a lot of flavor. I think the beef/vegetable mixture needs some Worchestshire or beef broth or something to make it a little sauce. Secondly, the potatoes had zero seasoning. I think at a minimum I would add garlic salt and pepper, but I would likely take out the filling, mash with seasonings and put it back in shell. Lastly, I asked 3 people at the meat counter what the equivalent of the meat listed would be and they had no idea. There was some eye of round sliced into thin pieces, so I used that. 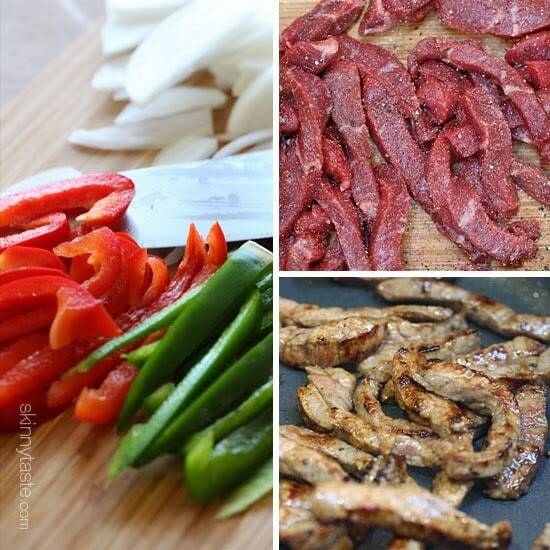 I want to make these in a few days, and I bought a beef round at the store. I was looking through the things I have in my pantry and noticed that I have a jar of preserved roasted red bell peppers. Do you think that I could marinate the steak in them and their sauce overnight? I did some light googling and no one seems to mention doing this, so I wasn't sure if it would have any adverse effect on my meat. Thanks again for the recipe; my boyfriend and I are totally jazzed to eat this. 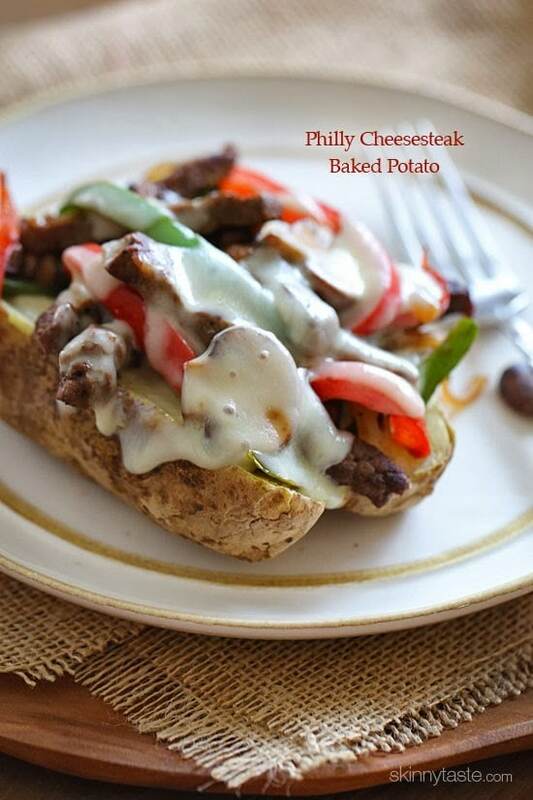 On your index under beef recipes, this is listed as "Loaded Philly Cheesecake Baked Potato"! Hahaha…I'm very glad that's not what it was! 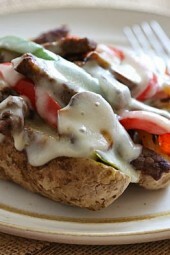 If you want to make this vegetarian, use sliced portabello mushrooms in place of steak AND small mushrooms!! WW Points+ calculator said it's actually 10 points…..
Of "coarse" you can! Really?! I made this last night but instead of the potatoe i used an actual hogie roll….OMG they were sooo good! Def will be a recipe to come back to! I made this for my family a few days ago and it was great. Except it seemed dry… the potato and meat and veggies had great flavor but made us want to drink a lot while eating. Is there some kind of sauce or glaze that can be added without adding too many calories? I would love to make it again! I made this yesterday and the meat mixture with the veggies was very good. I thought together with the potato it was just okay. I feel like the combo just wasn't creamy enough. Maybe I will add butter to my leftovers? I love your website! I discovered it a week ago and i've already made 5 of your recipes… I made this last night with chicken and it was AMAZING! I added some avocado on top because i love avocado. I was surprised how filling it was. Love it!! Thank you! I made these for dinner tonight. They were amazing. My husband was very impressed. I also did the WW Points+ calculator and got 10. Luckily, I had plenty of points left for the day. Thanks for another fantastic recipe. I input the nutritional info into my ww calculator and got 10 points plus. How do you figure 8? Great recipe! Really filling, too. Next time, I might add some beef broth to make them a little saucier so that it would soak into the potato. I doubled the recipe and portioned out 4 portions for the WW members of the family and then let the rest of them have the rest. FYI, when I put the fat, carbs, fiber, protein amounts into my points plus calculator it says its 10 points+. Made these last night – just as good today for lunch! Can't believe I never thought of this. Go Gina! I made this over the weekend and wasn't sure I would like it (why, I don't know) – it's AMAZING! Amazing and so quick and easy to make. 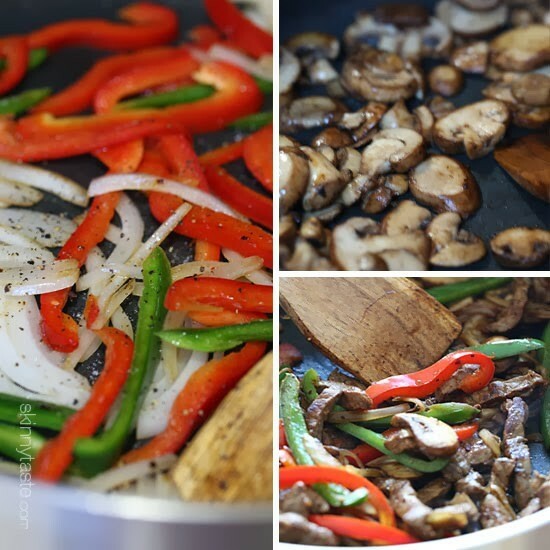 I bought beef round steaks that were sliced for fajitas so I didn't have to bother with that – just slice the veggies (I left out the mushrooms because I'm not a fan). Definitely a new favorite. Ditto! I am savoring every bite for dinner & watching "The Voice.". What a perfect combo! I love you Gina! I know what I'm having for dinner tonight, and it's so easy! Thanks. Yum! 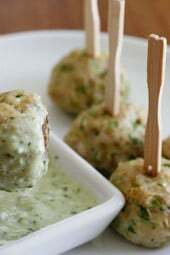 I am making this tonight, but with chicken! I don't eat red meat, and never cook it at home (my husband only gets it when we eat out). He doesn't really like cooked peppers, so I'm also going to make some broccoli for him. I'll let you know how it goes! It was a big hit for my wife. Glad I doubled it. Plenty of leftovers. However I like to pile on the cheese. I made this for Dinner last night. Yum yum loved it and so did the family. defiantly will make this again. Watch out for the olive oil part. I don't know if I didn't wait long enough for the pan to cool, but it instantly burst into flames once I added the oil. I've had this happen once before so I was ready with a pan top to smother the fire. What kind of oil did you use?! I use virgin olive oil in a pump sprayer and spray the grill with it even when it's cranked and it never goes up in flames. I have been making your recipes for years, Gina, and I always appreciate the comments that people leave so I figured it's about time I contribute! I made this for dinner last night and it was excellent. I couldn't find the steak at Trader Joe's but I bought their meatless meat strips and used those instead – just a few minutes under the broiler and it was perfect. Thanks! Perfect, thanks for leaving a comment as people really rather hear opinions from people who tried it. So glad you enjoyed! Eating this right now!! I swear your recipes are the best!! Gina, I have to ask. Do you use myfitnesspal? I am having this for dinner tonight, and thought that there would be no way this was listed in the database, as it's a new recipe. But, to my surprise, there it was. Awesome!! I do not follow ww, but your meals are on my table 5 nights out of 7! Thanks to you my Husband and I have lost a combined 80 pounds in the last 4 months. Southern Style….add barbecue sauce! Awesome! I think the non-meat-eaters would find portabello mushroom (sliced into long strips) to be a good substitute. That's what I'm going to try. I was just thinking the same with the portabello mushroom as a sub. I might try swiss cheese too – something about mushroom and swiss and onions….is it dinner-time yet? Can I peel off the potatoe skin before I put it into the mircowave? Wow looks amazing! I love baked potatoes and am thrilled to see a reasonable point topping option. Such a genius idea for a baked potato! For a rabid mushroom hater, does anyone have a good suggestion for substitution? I wanted to try zucchini or eggplant but was worried the water content would throw the recipe off? I would subsitute with green beans, kidney beans or pinto beans. Corn would be good in this recipe too. This looks delish! I may have to try this sometime this week. Looks delish! I am making this tonight and will let you know how it turns out! All of your recipes have been so good so far and I refer all of my friends to your site 🙂 PS- already pinned it! That looks amazing! I love baked potatoes and am thrilled to see a reasonable point topping option. I also don't know what cut of meat to look for at the grocery store – what will the name of the meat be on the package? Mine said choice beef round thin sliced sandwich steaks. Top round (a cut of meat), often mislabeled as London Broil (a method) can be sliced thin and used here. Sear briefly; don't overcook. Another good choice is flank steak, cut in half lengthwise, each half cut into thin, prox. 4" x 3/4" or 1" strips. 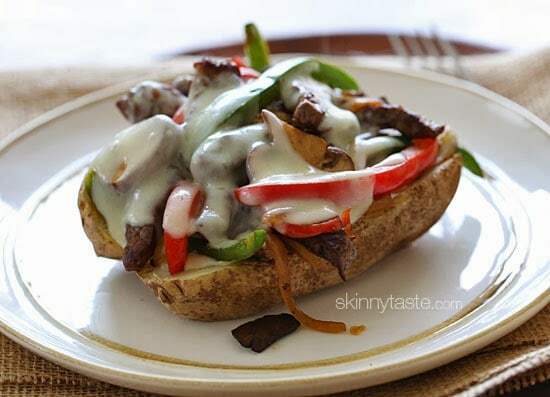 The meat mixture on baked potatoes are a match made in Heaven!! Great idea! Yummy! I will for sure be trying this one! Can I ask for "Beef Round Sandwich Steaks" at the butcher counter? I am terrible when it comes to asking for or looking for meat (other than chicken) at the store? Is there anything else this could be called? Silly question, I know – but I don't want to buy the wrong type of meat. This looks amazing. That's what mine was labled, you could also buy london broil and slice it thin. I am not sure what you mean by "remove the top of the potato". Are we supposed to hollow out the potato? 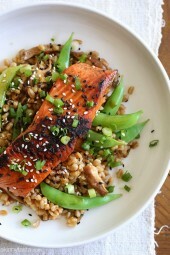 Please clarify for me, I want to make this TONIGHT it looks so good! OOps, I wound up cutting it in half… fixing now. This looks so good 🙂 Can't wait to make this. Courtney, I'm with you. Thinking right now of making this for dinner tonight, with chicken instead of beef. Yum! those pictures almost make me wish I ate red meat, haha. 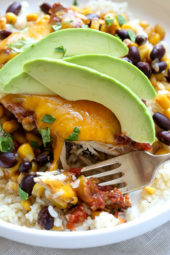 I may have to substitute for chicken and make these sometime this week since I have everything I need on hand already! Gah! You don't substitute FOR chicken, you substitute WITH chicken. Calm down. Did you know what she meant? Did it make you feel good to make the correction? Go troll elsewhere.